Beachy Head has always been a very special place for me. It’s magical, spectacular, breath-taking, wild and natural. I am fascinated by the lighthouses of Beachy Head, both Belle Tout and also the ‘new’ lighthouse at the base of the cliffs. I have been researching their history for years and am recognised as an expert on both lighthouses. In 2007 I tried to buy the Belle Tout Lighthouse at Beachy Head by public subscription to open to the public. I was, and still am, a key member of the Save the Stripes team and did everything I could to help spread awareness and raise money for the campaign. I appeared on BBC Radio Sussex on a number of occasions and on BBC Countryside to express our views and show our level of support. I also spoke to influential donators convincing them to part with their money, ran a competition and generally did what I could to help. In August 2011 I published the The Story of the Belle Tout Lighthouse and in April 2012 I published The Story of the Beachy Head Lighthouse. It covers the Beachy Head Lighthouse’s history from the original plans to construction, through the years to the modern day. With fascinating information and rare pictures showing the inside of the lighthouse and how the keepers lived day to day. This book was a project of passion whilst enabling me to help make money for the Save the Stripes campaign where 50% of the profits went to help save the stripes of the Beachy Head Lighthouse. A time line of activity is available on the Save the Stripes page. Media: You are welcome to use any of my photos the Save the Stripes group on Facebook, or from my personal Flickr account at http://www.flickr.com/rwassell but please credit ‘Rob Wassell’ and if possible with link back to this website for information on the Beachy Head Lighthouse. 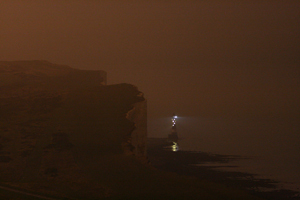 8th October 2013 – The best birthday anyone could wish for – I was going to visit the Beachy Head Lighthouse. We set off from Sovereign Harbour with Excalibur Charters in the morning with Martin and Sam from Sussex Blast Cleaning, a Press Association photographer and a BBC breakfast news crew. Shirley, Elaine and Mike from Save the Stripes were also with us. I got to go on the lighthouse and got interviewed by the BBC too! All in all an amazing day, one I will never forget. Read more here or see loads of great photos on Flickr. 1st October 2013 – Having done an interview for ITV Meridian at Beachy Head, I took the opportunity to check on progress. They have finished the base coat for the white stripes but were hampered by the weather. The weather cleared a little and they managed to get back on the tower and were starting on the base coat for the red stripes. Then it will just be a case of applying the top coat for the red and white stripes and then tidying up. More on Flickr. 26th September 2013 – Today was the most amazing adventure as I set off at 7am this morning to go down via Birling Gap, along past the lighthouse to check on progress close-up, then back up via Cow Gap, up over the top of the cliffs and ended the day off with an amazing boat ride. You can read more about my great adventure and there are loads of photos of the progress of the Save the Stripes of the Beachy Head Lighthouse on Flickr. 25th September 2013 – This evening I took some long exposure photos of the lighthouse with its lights on. 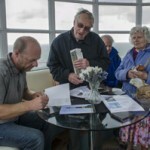 This is the first that people have stayed on the Beachy Head Lighthouse since 28th June 1982, that’s over 30 years. The crew are sleeping in the same curved bunks that the lighthouse keepers used to sleep in. I felt that this was so symbolic that I had to record this in photos. 23rd September 2013 – It was a beautiful day at Beachy Head today and it was nice to see the Sussex Blast Cleaning team making great progress jet-washing the tower and treating rust on the lantern. The temperature was in the twenties and it must have been quite hot work dressed up in overalls, harness and other protective gear. 21st September 2013 – Great to see the Sussex Blast Cleaning crew hard at work today. They were jet-washing the lantern at the top of the tower. Its amazing to see the guys in action. It gives you a greater sense of scale and makes you realise just how big the lighthouse is. The tower is 141 feet high and even when you consider the equipment they have to work with, like the jet washer and the lengths of hose and cable – amazing. 20th September 2013 – The Sussex Blast Cleaning team popped in at the Belle Tout Lighthouse open day yesterday. 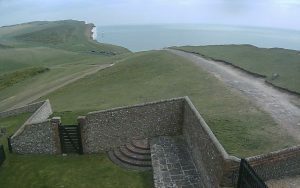 They had previously worked on the renovation of the Belle Tout Lighthouse and this is the first time they have been able to see it since completion. They also gave us an update on the repainting of the Beachy Head Lighthouse. Weather permitting they will finish unloading all of the equipment and provisions on Friday 20th September, enough for a three week stay at the lighthouse, just in case they can’t get off and back on the lighthouse again due to weather conditions. On Saturday they will begin the construction of the scaffold from which the crew will abseil down the tower. They will use a high pressure jet hose to clean the tower, treat any rust and then begin painting. The work will take the best part of three weeks. 19th September 2013 – The Belle Tout Lighthouse first even open day, organised to coincide with guest rotation and the start of the work to paint the stripes. Unfortunately we weren’t able to see any painting activity due to rough sea swell but we were able to welcome over 100 guests. I was book signing and talking more about the history of both Belle Tout and the Beachy Head lighthouses. Ian the manager made guests feel welcome and the owner David Shaw was also able to attend for a while. Sussex Blast Cleaning also made a visit and was able to explain more about how they are going to carry out the work. Save the Stripes Shirley Moth and other team members were able to come as well as the local artist Margaret Turton. All in all a really wonderful day. 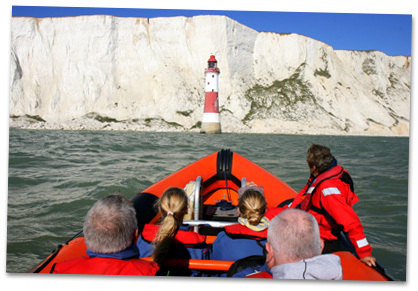 16th September 2013 – Well here we are, the painting of the Beachy Head Lighthouse starts this week. Its been an incredible journey and its amazing how much time has passed since the Save the Stripes campaign started raising the money and now the start of the painting. The paint donated by Hempel Crown has already arrived at Brewers in Eastbourne and there are photos on the Save the Stripes Facebook group to prove it. I am going to be following the re-painting very closely so that I can include it in my next book and its an important chapter in the history of the Beachy Head Lighthouse. If you see someone armed with their camera at Beachy Head over the next few weeks, it could well be me. 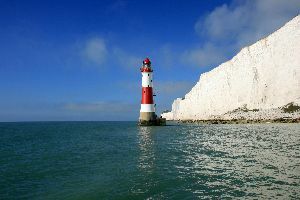 16th August 2013 – The contract to paint the stripes of the Beachy Head Lighthouse has been awarded to Sussex Blast Cleaning. 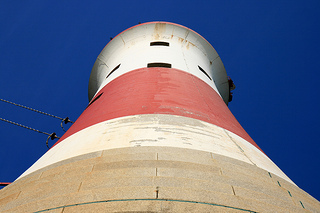 Sussex Blast Cleaning are based in Hailsham in East Sussex and it’s great news that the contract to repaint the lighthouse has gone to a local firm. You can find out more about Sussex Blast Cleaning by visiting their website. 14th July 2013 – An update from Warren, Lighthouse Manager at Trinity House. “I am sorry this has taken so long but we needed to get the paint specification agreed to our requirements, which will also ensure your money is being well spent for the longevity of the paint. 28 June 2013 – We finally have a date for when the painting of the Beachy Head Lighthouse is to begin – the 17th of September 2013. The agreement of the paint specification and the finalisation of the contractors (which is still ongoing with the Trinity House procurement team) has played a part in the process taking a little longer than expected but at least we finally have a date. I’ve added a timer to the site so that we can all countdown to the re-painting of the lighthouse. This is assuming that they arrive at the lighthouse around 10am on the morning on the 17th. 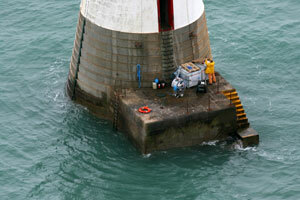 Its high tide at 09:24am and the painting crew and equipment will need to arrive by boat. It turns out the crew are going to be staying at the lighthouse during the duration of the works – lucky devils! I’ll be following the re-painting with interest. Armed with my camera I will be taking photos for my new book. I am sure I will bump into a few others who will be eagerly following the painting of the lighthouse and snapping away for their own photography collections. Maybe I will see you there. 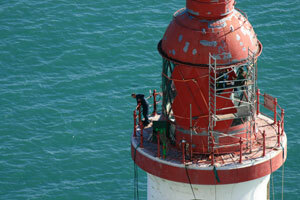 21 June 2013 – It’s all go since we raised the money to re-paint the Beachy Head Lighthouse. This month Hempel Paints have sent a specification of the paint to Trinity House which is currently waiting for approval. Once approved the paint will be sent to Brewers in Eastbourne ready for a contractor to paint the stripes. 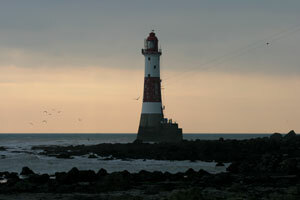 14 June 2013 – Once Trinity House receive the final specification they will proceed with the tender process to find a contractor to paint the lighthouse. 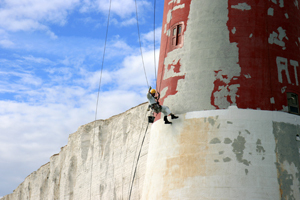 I will be following the re-painting of the Beachy Head Lighthouse in detail and I will post updates and photos in due course. On Friday the 7th June 2013, prior to low tide, I embarked on a walk from Cow Gap to see just what a state the Beachy Head Lighthouse was in and how much the lighthouse paint had deteriorated since I was last there. I have been up to the lighthouse umpteen times, but this was the first opportunity to see the lighthouse up close for fellow novelist and writer, Cherry Radford. One of the main reasons for this trip was to take photos prior to the re-painting of the lighthouse that will be included in my next book. It was great to see the ‘old girl’ again though and I would never tire of the walk. It was incredibly windy, so windy that whilst at the lighthouse you could hear an eerie howling sound and the wind was so strong you could hardly stand up. It just re-emphasises what it must have been like to be a keeper at the Beachy Head Lighthouse. On the 2nd November, Shirley Moth announced that we officially broke through the £27,000 we needed to save the stripes of the Beachy Head Lighthouse. What an accomplishment. You can read more about the Beachy Head Lighthouse Save the Stripes Campaign. The last stone was laid on the 25th February 1902 and the lighthouse came into operation on 2nd October 1902. 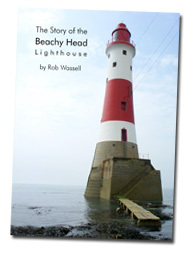 You can read more about the history of the Beachy Head Lighthouse. Trinity House had decided not to re-paint the Beachy Head Lighthouse and allow it to slowly fade to its original light grey granite colour. The news that this world-famous and iconic lighthouse would lose its unmistakable red and white livery caused some controversy. Read more about the Saves the Stripes campaign. Sussex Voyages very kindly donated four tickets to the Save the Stripes campaign to help raise money to get the lighthouse re-painted. The competition ran between 22nd February and 25th March 2012 – click here to find out more.